After starting out with a couple of big disappointments, March is turning out to be a pretty solid month at the box office. Three new films hit the box office in wide release. You might be forgiven for being a little apprehensive about the release Horton Hears a Who, fearful that your childhood will take yet another beating from lousy Dr. Seuss adaptations. The last two features based on his work, The Grinch and The Cat in the Hat, set the standard for crappiness in children's film, and made for some seriously creepy imagery. Dr. Seuss was just not meant to be rendered in real life. More promising, then, is the decision to make Horton into a fully CGI animated film, capturing that Seussian look and feel in a more natural way. It does of course, have Jim Carrey, who was part of the horror that was The Grinch, but he's a lot more tolerable as a voice than some makeup-covered thing. 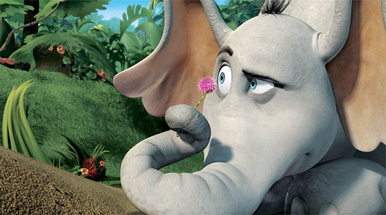 Carrey voices Horton, who, as you would know if you were ever a five-year-old child, is an imaginative elephant that discovers a civilization of Whos on a speck of pollen that seemingly, only he can hear. The other elephants don't take too kindly to what they think is Horton's delusion, and they'll destroy Horton's speck unless there's some proof that the Whos exist. He communicates with one of the Whos, voiced by Steve Carell, to try and convince all the Whos to make enough noise to be heard. I'll let you figure out how this one ends. The lesson, here, is that you should always believe anyone who looks delusional. The animation here looks pretty fantastic, and while I'm a bit dubious of how the premise could be effectively extended to a 90 minute film, critics seems to be lining up behind it, praising it for, well, not sucking, at least. It's likely to capture a lot of family crowds this weekend, and I see a weekend total of about $41 million. It seems about time that Hollywood jumped on the MMA bandwagon. Never Back Down is one of the first big releases to tackle the sport of mixed-martial arts, asking that crucial question, "What if The O.C. had more bloodsport in it?"